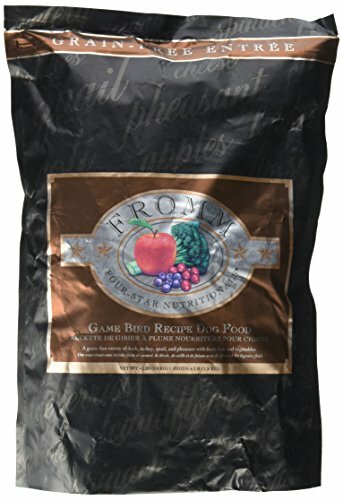 Is Fromm the best dog food for my growing puppy? Hey there everyone! 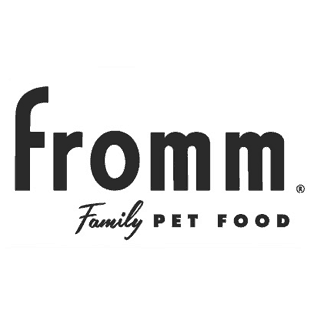 We’re psyched to be reviewing Fromm today, and hope you’re looking forward to learning about one of our favorite healthy dog food brands. Whether you’ve got a toy, giant, grown or puppy dog, our team has done all the squinting for you when it comes to reading those Fromm dog food labels. We’ve also done all the leg work for you around checking out which puppy food or dog foods are most suited to your particular little one. So, we’re confident in our ability to present an all-American brand that makes some seriously great dog chow! Why the Fromm puppy food and Fromm dog food reviews? What do brands mean when they talk about life stages? 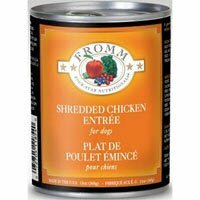 How do I switch my dog to something from your Fromm dog food reviews? So, can I still give snacks to my dog or puppy? They’re the Niemans, actually! What we mean is that Wisconsin-based Fromm are first and foremost, a family brand that’s been handed down through generations since 1904. If you’re the type to be concerned about manufacturing quality, you’ll feel good knowing that the family actually operate and own their own factories near Wisconsin. Their first product in 1930 was actually a vaccine for the viral canine distemper disease, and since then they’ve been making awesome, natural dog food for our pooches that’s varied in its focus- but always with our puppy and dog’s health in mind. 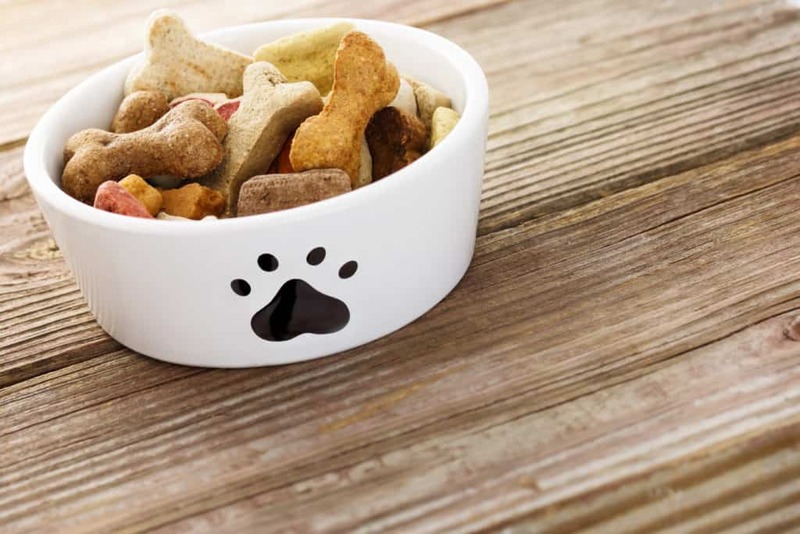 We especially like that they’ve considered those puppies and dogs who are losing weight, alongside those who have special dietary needs as a result of allergies. If the first is one of your pups or dogs, then the Fromm Family Classics range is also designed to give him variety while helping him get back in shape- so it won’t really feel like dieting! 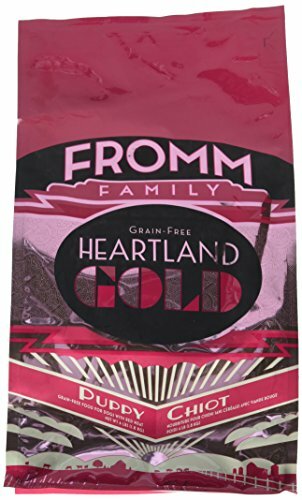 If the second one is more relevant- say you’ve got a puppy or dog with certain food intolerance- Fromm also include several great options amongst grain free puppy foods in their Four-Star Nutritionals selection. Well, let’s start with the fact that Fromm make no less than three different artisan linesof distinct and specialized dog food. The Classic line’s a good place to start, as it involves a whole heap of super chicken options for your senior dog, regular adult dog or dog with a weight loss goal. So let’s take a good look at the products that make out Fromm Dog Food Reviews and Fromm Puppy Food Reviews so worthwhile! This large puppy breed food is a great example of the way Fromm use so many different ingredients to try and prevent any potential puppy allergic reactions. 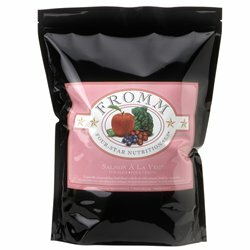 Because there are a lot of diverse, quality ingredients in Fromm, your puppy won’t be eating anything in too large a quantity- this means he’ll be far less likely to have any adverse reactions on the off chance he’s intolerant to something. Lentils and chickpeas alongside the hearty beef, lamb and egg ingredients for 26% protein! Specifically formulated so that larger breed dogs like Great Danes, Rottweilers, Labradors and Pit Bulls can grow up strong and fit! We could say that it’s slightly less on the economic side compared to other puppy foods for those large breeds, but it’s all for the sake of enacting top-of-the-range quality control measures…so, worth it! Here’s another prime example of Fromm’s wide-ranging ingredient selections. Aside from this game bird recipe, the Four-Star is bursting with creative flavors from lamb with lentil to beef frittata! Oh-so-many colorful and yummy veggies for your dog! Nope, we’re happy as can be with this- and we reckon your puppy or dog will be too! My gosh is this one POPULAR with dog owners everywhere, including us. Because it’s a suitable chow for all life stages, it’s great if you’ve got both puppies and adult dogs. Even better, it’s full of so many veggies that we’re blown away, it’s impressive, even for Fromm! We know, we talk about fruit and vegetables so much- but looking at the amazing diversity of minerals and vitamins in Fromm’s Gold puppy food, we reckon it’s justified. Plus, it’s got calcium from cheese! Made not only with chicken and cheese, but with lamb, too, and the headlining ingredient is…duck! Salmon oil gives DHA to your pooch, helping him develop those famously sweet puppy dog eyes! So this isn’t specifically described as a puppy food, but it sure is one- it’s formulated for all the life stages as per the AAFCO requirements and packs a real punch in terms of protein, fat, and calcium. Made with safflower oil, which contributes Omega-3 as well as Omega-6. Shiny coats, here we come! There’s natural glucosamine in that chicken cartilage! Easier digestion through probiotics such as Lactobacillus. Contains grains in the form of rice and barley. The Salmon À La Veg kibble is definitely great as a puppy food. It’s also made with plenty of fresh produce. While it’s not entirely grain free, it’s stayed away from those filler ingredients that make low quality puppy foods look bad like milled corn gluten. This is very much the case with ALL Fromm puppy food, happily enough! 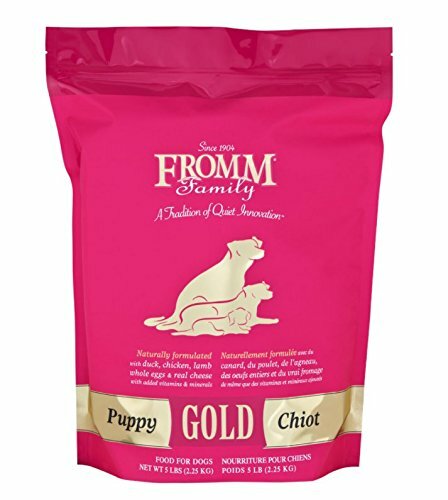 Fromm’s pretty much a top-of-the-line, premium contender when it comes to making a choice for your puppy or dog. That’s partly because due to their awesome stance on keeping quality right up there while ensuring your puppy has so much choice that his tail won’t stop wagging! This shredded chicken wet puppy food is so suited for a treat, don’t you think? We adore the fact that beans make up a good amount of the protein, which keeps his blood sugar in check. The beans are also where some of the iron, the potassium and the magnesium come from. At only 228 calories for each can, it can be flexibly mixed in or up to each puppy meal without too much concern about whether they’ll gain extra pounds. Even though it’s got a 7% for protein, which is a little on the low-ish side when it comes to wet varieties of puppy food specifically, it’s certainly great as a yummy food to mix in with his dry kibble puppy food! While it can’t promise your dog or puppy freedom from any chicken or egg products, it’s grain free and has great, non-artificial sources of glucosamine, vitamins and antioxidants. Always and as usual, it’s practically bursting with natural vitamin goodies like sprouts, cranberries, cauliflower, blueberries, apples, peas and so many more! Fat’s at 19% and sourced from real chicken. Sorry, this one’s not entirely suitable for those of our doggy friends with sensitivities to egg or chicken. Okay, maybe we’re a little biased because one of us owns a Yorkie. And maybe (just maybe! 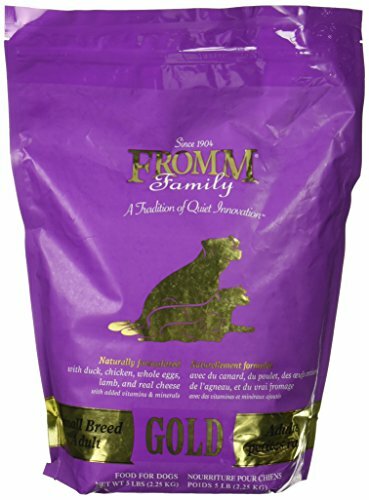 ), that team member feeds their Yorkshire Terrier with Fromm Gold for Small Breeds. So, here’s a super popular one that we just couldn’t skip over! Duck has a starring role in this dog food for small, yet grown-up breeds! Small kibble size for our little Yorkies! Yet again, it’s stuffed full of iron and zinc! It’s not grain free due to its rice and barley content. What can we say, at 416 kCal within a cup, we aren’t too fussed about the slightly higher price tag compared to other dog foods of lower caliber. It’s also got chicory root in it to help keep those nasty worms away! 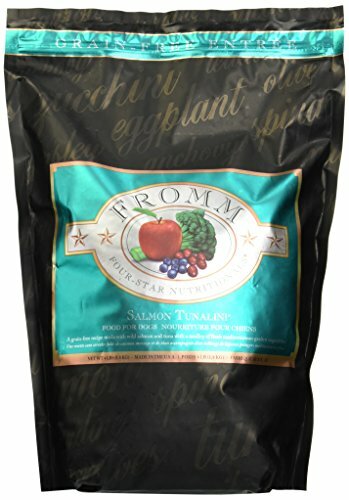 In short, higher quality brands like Fromm tend to create special formulas for puppies, fully adult dogs and seniors. Each of these formulas will have a unique profile according to the AAFCO when it comes to whether or not the dog food you’re buying meets the needs of your puppy, adult or senior best friend. If a dog food such as Fromm satisfies these criteria, it means your dog is getting the balanced and complete array of nutrients necessary for it’s particular ‘life stage’. As we’ve mentioned before, this usually means puppies will be eating greater quantities of macronutrients for ongoing growth, while lower amounts of things like protein will be present in dog food that’s designed for adults. First up, we’re looking to minimize any risk of an upset tummy for your dog or puppy. Switching over to Fromm means taking it slowly and gradually, and can take between 1 to 2 weeks. During this time, you’ll want to introduce your puppy or dog to about a quarter of Fromm mixed around with his original food, then gradually level up the proportion to half old and half new after a couple of days or so. Should your puppy or dog be fine during all this, you’ll soon be feeding 100% of the quality dog food or puppy food we’ve included in our Fromm dog food reviews! The foods in our Fromm puppy food reviews and Fromm dog food reviews is thoughtfully crafted to address the caloric requirements of your pet’s life stage and whether or not they’re in need of losing a little weight. This generally means that you’ll be feeding him certain amounts at each mealtime according to the guidelines on the packet, or one of our reviews for specific breeds. Outside of this, there’s no reason why your puppy or dog shouldn’t be allowed to enjoy some healthy snacks here and there- think things like carrot, broccoli, or even pumpkin. Veggies like these are often a smart way to keep your puppy or dog on top of his vitamins, and using only the examples we’ve given, he’ll be getting good doses of carotenoids, phytonutrients such as glucosinolates, manganese, copper, B vitamins and also vitamins like A and C!